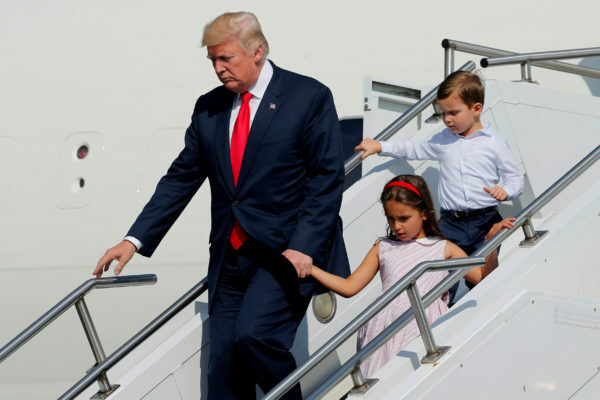 U.S. President Donald Trump, with his grandchildren Arabella Kushner and Joseph Kushner, arrives aboard Air Force One for a summer vacation at his Bedminster estate, at Morristown Airport in Morristown, New Jersey, on August 4, 2017. BEDMINSTER, N.J. — President Donald Trump, who knocked his predecessor’s work ethic and said he probably wouldn’t take vacations as president, has settled in for 17 days here at his secluded golf club in New Jersey’s fox-hunt and horse country. Aides are billing Trump’s time at one of his favorite properties as a “working vacation,” a notion bolstered by his arrival on Air Force One on Friday with a retinue of aides, including his newly minted chief of staff, retired Marine Corps Gen. John Kelly. In fact, within hours of arriving, Trump felt compelled to issue a statement defending his national security adviser, H.R. McMaster, who has been under fire from conservative groups for pushing out several hard-liners on the national security staff and renewing the security clearance of former president Barack Obama’s last national security adviser, among other things. Trump was briefed on Saturday morning by Kelly on a Marine Corps helicopter crash off the coast of Australia. A series of meetings and phone calls are expected with several lawmakers, who face a weighty agenda next month, including a request from the administration to increase the nation’s debt ceiling, as well as promised action on tax reform. And it’s possible Trump’s time away could include a couple of day trips elsewhere to highlight initiatives or rally supporters. “The president will continue to work over the next two weeks,” said deputy press secretary Lindsay Walters, who is among the White House staffers on site this weekend. She attributed Trump’s relocation in part to long-planned renovations taking place in the West Wing, including an overhaul of the 27-year-old heating and air-conditioning system, which have forced staff to temporarily move to another building. Trump’s trip, nevertheless, is very much in keeping with a tradition of presidents escaping Washington during the late summer. Martha’s Vineyard, known for its affluence, became the choice summer vacation spot for both President Bill Clinton and President Barack Obama. Clinton was also known to make summer trips to Jackson Hole, Wyo., and the Obamas visited several national parks. President George H. W. Bush spent his vacation time at the family compound in Kennebunkport, Maine. President George W. Bush would usually take breaks on his ranch in Crawford, Texas, famously clearing brush and sometimes drawing criticism for the length of his getaways. Both as a private citizen and candidate, Trump was merciless in his critique of Obama’s time away. “@BarackObama played golf yesterday. Now he heads to a 10 day vacation in Martha’s Vineyard. Nick work ethic,” Trump said in one 2011 tweet. Trump decamped to Mar-a-Lago, his private club in Palm Beach, Fla., on seven occasions in the early months of his presidency before shifting his weekend travels here. The president has a special fondness for Bedminster, where his daughter Ivanka and son-in-law Jared Kushner – now both senior White House aides – were married in 2009. Several family members have homes on the property, and at one point, Trump planned to erect a mausoleum for himself overlooking the golf course. Bedminster Mayor Steven Parker said Trump’s presidential visits have started to become more routine for the township, which is now getting reimbursed by the federal government for the costs of police overtime and other security-related costs. For a polarizing president, there have been relatively few and mostly polite protests. An anonymous New Jersey artist carved the word “resist” in a nearby cornfield last month. And there have been caravans of detractors who periodically drive by Trump National Golf Club, which sits off a two-lane road without a shoulder and, like many of the township’s sprawling farms and estates, can’t be seen by motorists. “Other than honking horns and maybe disturbing some farm animals, I haven’t heard many complaints,” said Parker, a Republican. Since becoming president, most township residents haven’t seen Trump in person. Promotional materials for the club tout its “magnificent” 25-meter pool, its “five luxury multi-bedroom cottages,” its 36-hole golf course and its private helipad. The roughly 425 members of the Bedminster club seem to be drawn largely from the New Jersey suburbs of New York City, including a number of people from the financial-services sector. The golf club is the second-largest taxpayer in the township, and local businesses have reported an increase in patrons during Trump’s stays. The township is part of Somerset County, regularly ranked among the 10 wealthiest American counties. The township’s understated pastoral setting obscures its wealth. Households had a median income of $96,644 in 2015, according to federal records, or more than $40,000 above the national average. Its affluence is in part thanks to the biotechnology and telecommunications companies that are located in and around the town. Two pharmaceutical firms – U.K.-based Mallinckrodt and Japan’s Daiichi Sankyo – launched major operations in the area just this summer. Local businesses tend to serve the area’s high-income earners. Nearby, equestrian facilities and multimillion dollar homes lie between the unpaved country lanes and Revolutionary War sites. One house bordering Trump’s club is currently on the market for $2.49 million, offering five bedrooms, an elevator, pool and marble floors. Bedminster’s politics are friendly to the GOP, if not always to Trump. Thetown handily went for Republican presidential nominees Mitt Romney in 2012 and John McCain in 2008, but Trump won it by just eight votes in November over Hillary Clinton. The town, which is 86 percent white, is represented in the House by Rep. Leonard Lance, N.J., a moderate Republican. He recently earned attention by voting against the GOP health-care plan championed by Trump.